HTTPS from Blogger: D2L is happy again! D2L and Mixed Content. Right before Fall semester started, I went through a terrible time with my D2L homepage. 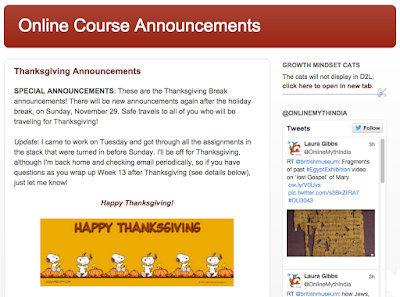 For years I had used my blog of Class Announcements (updated daily) as the landing page that students saw as they passed through either to the Declarations (Quizzes) or the Gradebook, and I was really happy with that. But then, starting in Fall 2015, the "no-mixed-content" rule meant that my Blogger blog would no longer display inside D2L. It was a disaster! 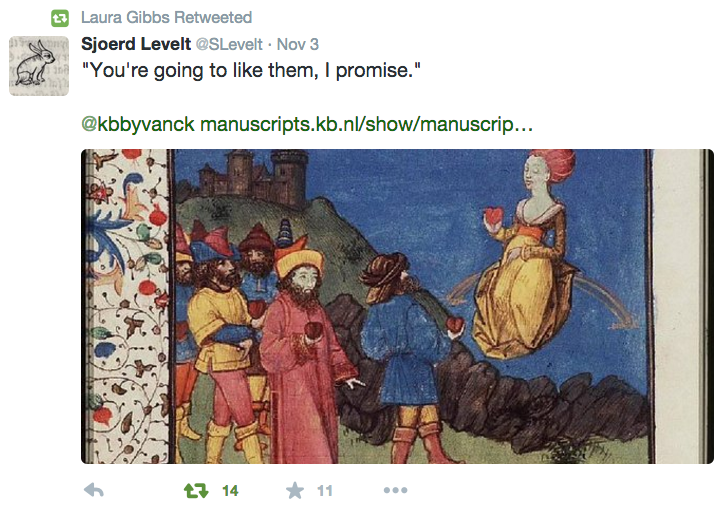 My Twitter Solution. So, I switched to a static homepage with link on the left and a Twitter stream on the right using my class Twitter stream. That was an okay solution, and it certainly made me more Twitter-aware since Twitter was the only dynamic content I could share with my students as they passed through the homepage of D2L. I don't use D2L for content or discussions, but it is where students record and track their grades (they do the grading, not me), which means I do get a lot of D2L traffic as a natural part of students completing and declaring their work for the class. 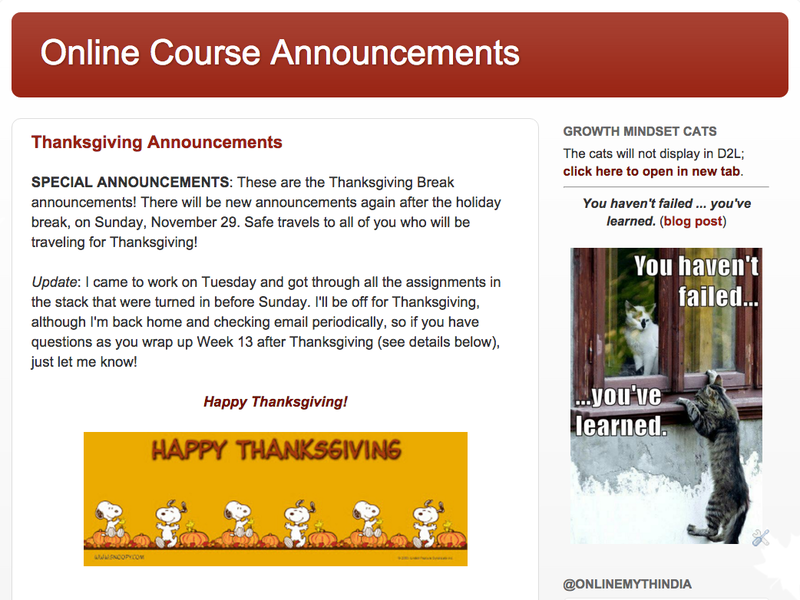 So, I turned on HTTPS for my Announcements blog, and then set up a test homepage in a D2L course for next semester. It worked! The only content that was blocked was the randomizing widget of growth mindset cats along with some other randomizing widgets I had in the sidebar just for fun. So, I removed those other widgets, made the Twitter widget longer to fill the space, and then I put the growth mindset cats up at the top of the side bar with a message to my students that they just had to click to get a version of the announcements in a separate window that would show the cats. 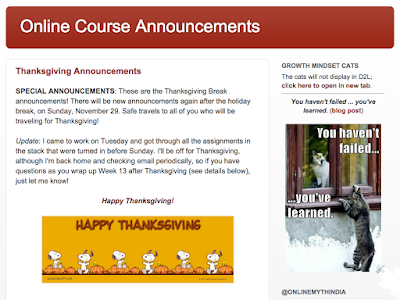 Since a lot of my students are into the cats, that will be a good incentive for them to break out of the D2L prisonhouse and view the announcements as they should be viewed: in a tab of their own. THANK YOU, GOOGLE! Discovering Blogger HTTPS is like getting an early Christmas present from the Google Mind itself, and I am really happy about it! 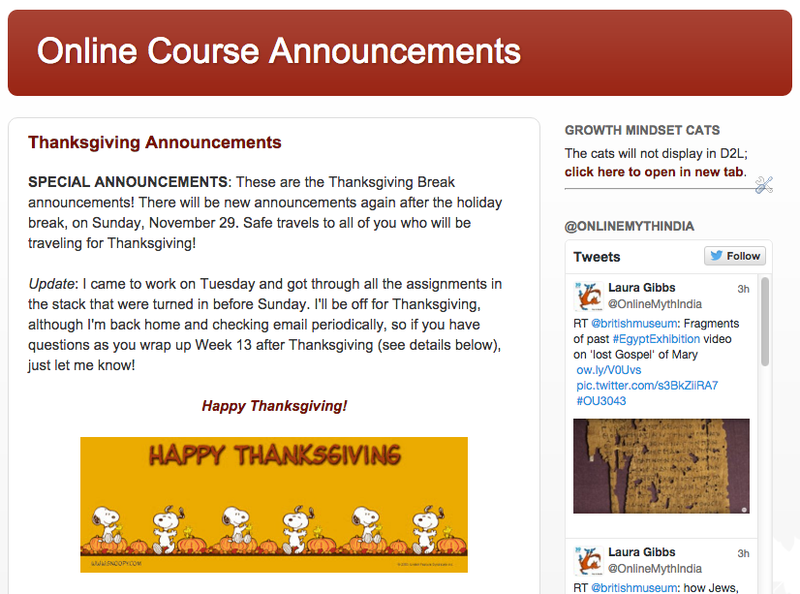 The Twitter solution I was using was okay, but it was not great, and the students who most needed to see the announcements were missing out on them because it required an extra click to get to the Announcements blog from inside D2L. Now we are back to the "nowhere to run, nowhere to hide" approach to the Announcements blog. And since the announcements are an important part of my class, I am very happy that those announcements now have a better chance of reaching the students who most need to read them. I don't have much to say about the Twitter hearts except ... NOOOOOOOO!!! Luckily, the StarBack app came to my rescue: one of the many reasons I prefer browsers to apps. I have more control, thanks to the genius extension-writers. Thank you, StarBack! 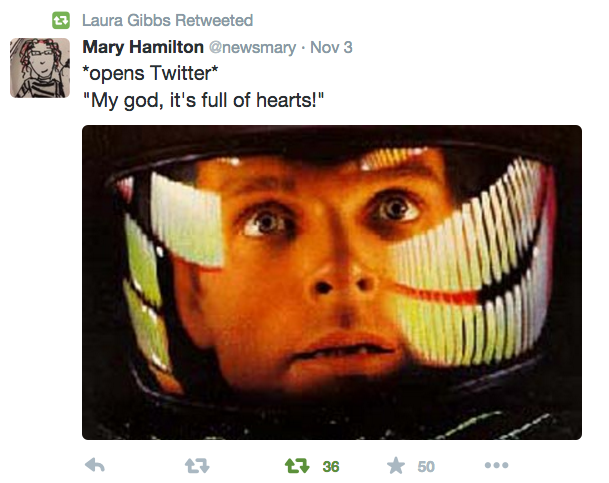 I learned about the extension in Wired: Fear Not: You Can Use Chrome to Bring Stars Back to Twitter. Well, I have been very neglectful of this blog of late... but I've been busy, I promise (see the stream for details day to day). Anyway, on my walk today I thought of something really nifty to try: a blog randomizer using iframe. I'm not really into iframe as a tag, but that's how Inoreader does the HTML clipping view of RSS streams, so I've come to appreciate how useful it can be. And I linked to the random blog pages at the Blog Directory and also at the Myth-Folklore hub and the Indian Epics hub. 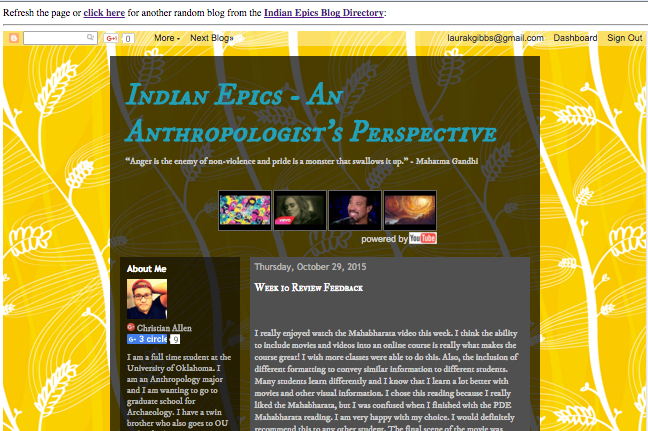 Here's a screenshot that shows how the random blog fills the screen with just a single line across the top to let people refresh and reload. Welcome! For more about me, my work, and my other online activity, visit MythFolklore.net. Questions about reproducing / reusing this content? Contact laura-gibbs@ou.edu. Picture Window theme. Theme images by Jason Morrow. Powered by Blogger.